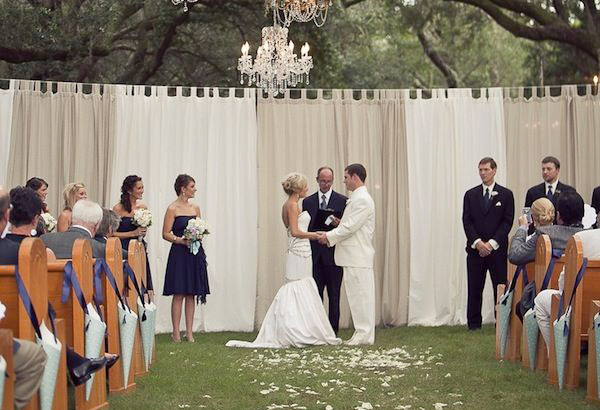 We’ve rounded up ideas for the most amazing ceremony backdrops from all over the internet! While we don’t have directions for how to build even a single one of these, we’re sure you’re creative and can rig up something gorgeous. Below each picture is a suggestion for how to accomplish it (or just some gushing about how gorgeous it is)! Which one is your favorite? Tag us on Pinterest when you pin them and let us know! 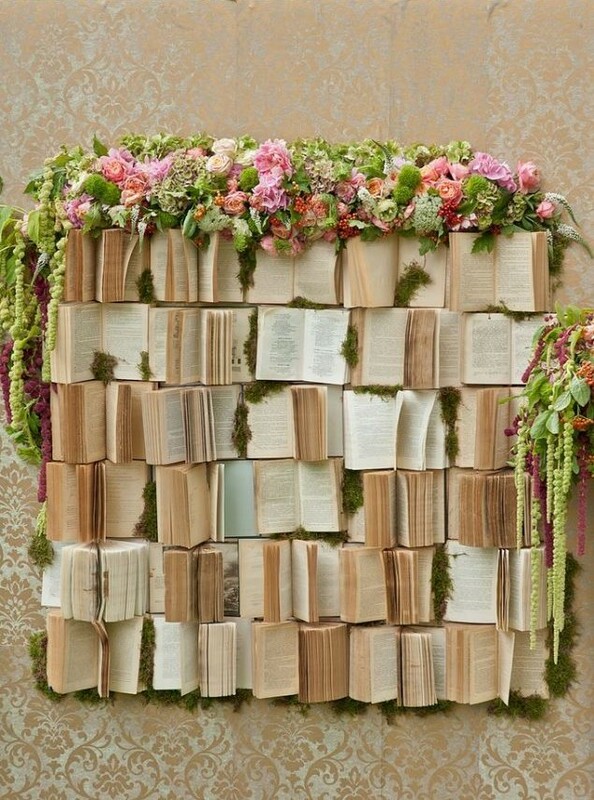 For a literary couple, a wall full of books is the perfect backdrop for reciting vows – maybe the vows include passages from their favorite books? This would be pretty easy to make, with industrial strength glue (heyyyy, we love that E6000!) and some cheap books from the bottom shelf at a thrift store! Talk about something you can recreate yourself! This is two Kallax bookcases from Ikea, which you can probably find on Craiglist if you plan far enough ahead. 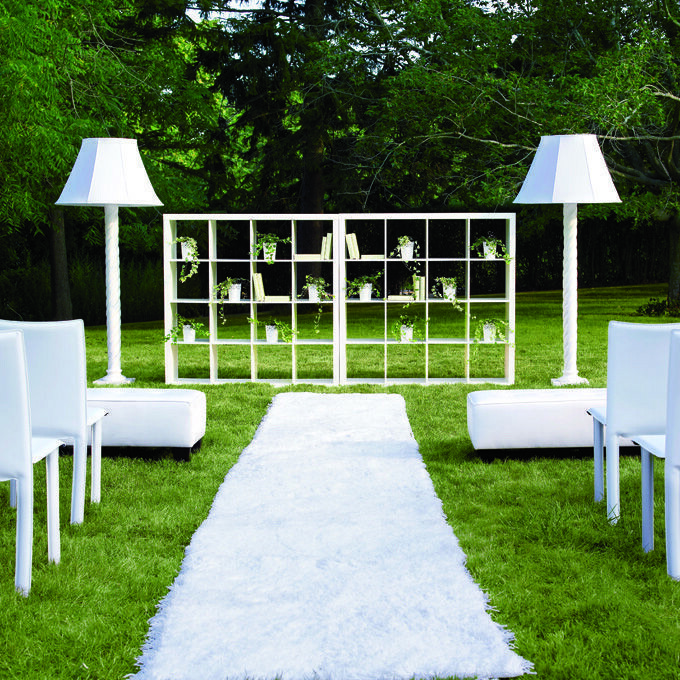 Set them at the end of the aisle with some lovely mementos that are personal to the two of you, or fill some of the cubbies with greenery, as seen here. Fill a tall, industrial space with a creative and natural backdrop. 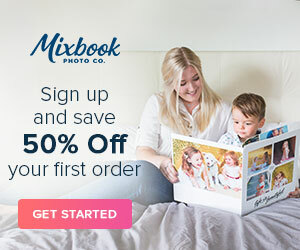 Get a long flowerbox (you can find them at home supply stores, or you can probably make one out of pallets – there’s bound to be a How-To on Pinterest!) and fill it with floral foam or even just plain old dirt, then top it with soft moss. Artfully stab in some branches a little taller than you, and voila! 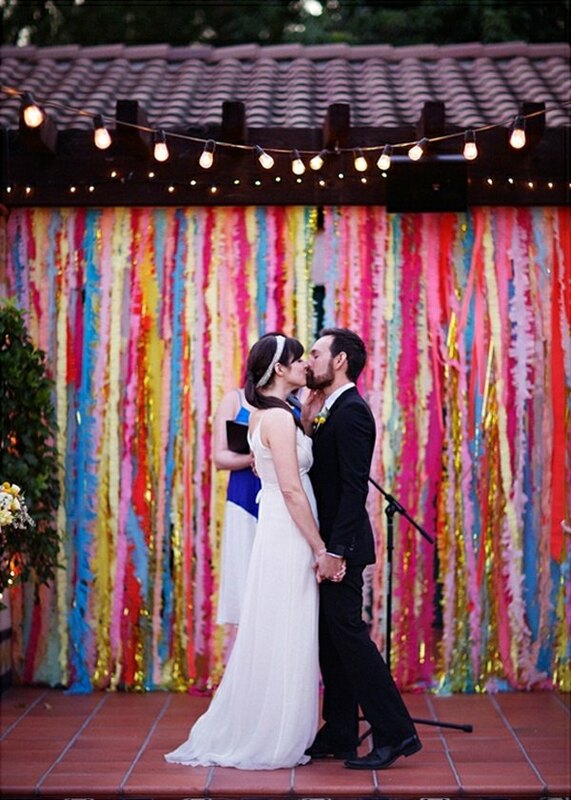 Fun and funky paper streamers make a gorgeous backdrop of riotous color! You can find lots of different textures and colors from bulk party discount stores and even the dollar store! 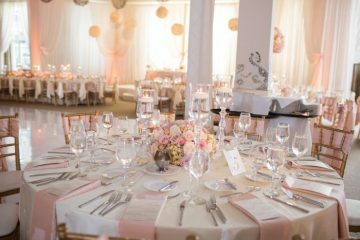 Covering sheets of plywood with fabric in your perfect wedding color is a great way to create a stunning and simple backdrop. 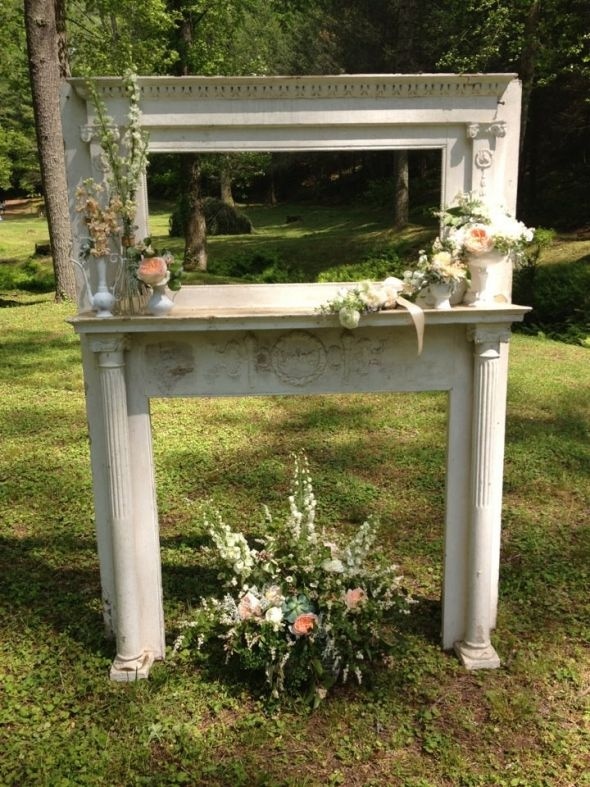 With or without flowers stationed on either side, this is a striking tableau to get married in front of. You could also look at adding interesting touches to the borders. It doesn’t get too much easier when you’re trying to keep it simple. Finding a clean concrete wall will be the hardest part of this backdrop! 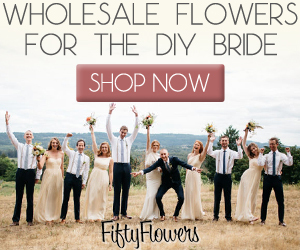 Get the little ones in the family involved in the lower flowers, and create a two dimensional garland at the top for a sweet backdrop of chalk flowers. A delightful backdrop of balloons will brighten up any space, especially when inexpensively back lit with something like this clamp lamp. 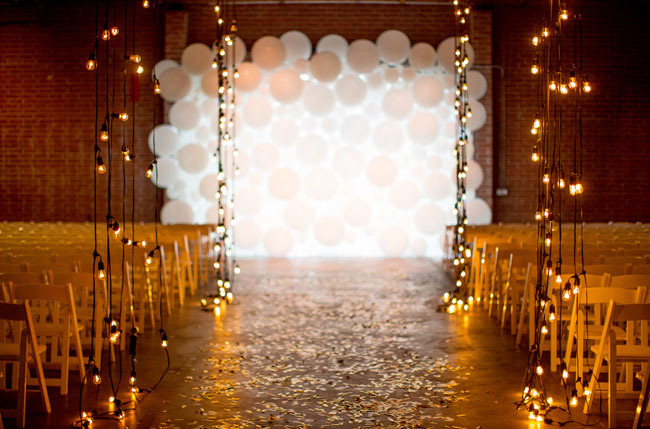 No helium needed, just connect the balloons to a light sheet, double-sided tape or connected to strings taped across the doorway. 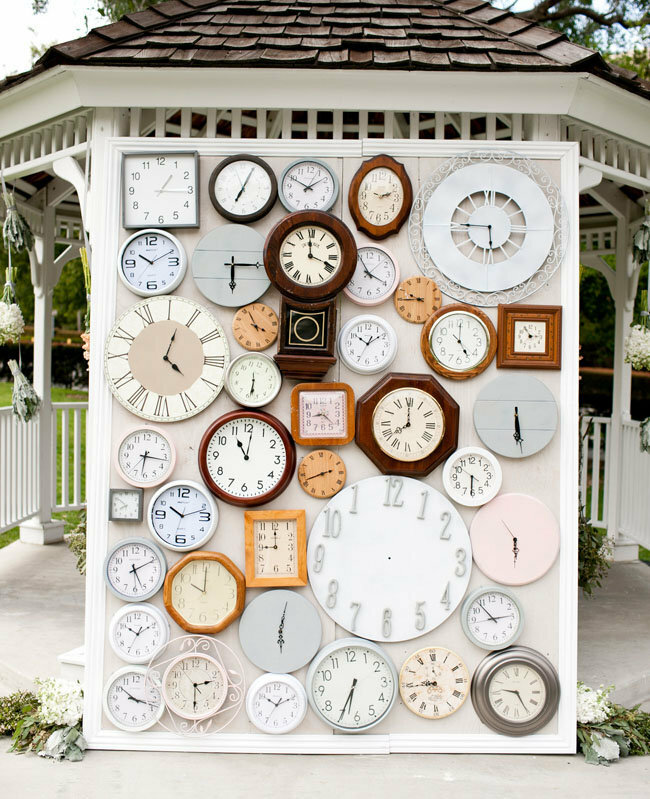 A clever and creative way to say “It’s Time To Get Married!”, a wall of various styles of clocks might not be the most affordable backdrop to create, unless you just happen to be a clock aficionado. But if you aren’t hoping that they’ll all tell (accurate) time, affixing them to a frame shouldn’t be too hard! Check out this hammer and drill guide at HealthyHandyman. 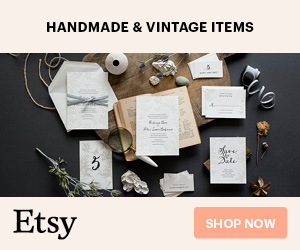 They give you an idea of the tools you need to recreate this timely backdrop! For an elegant indoor backdrop, an elegant side-swept curtain with a striking chandelier centered above it sets the perfect scene. 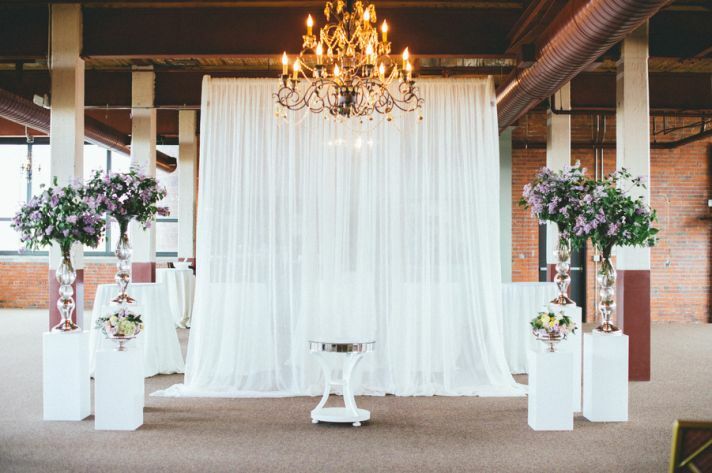 Using a long, sheer curtain transforms an industrial space and is a perfect way to separate the ceremony space from the reception space in a very inexpensive but dramatic manner. 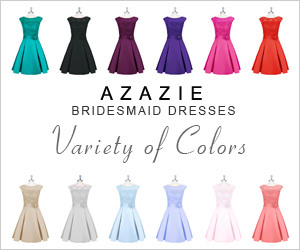 While you could buy brand new fabric in your wedding colors, a less expensive option is to buy plain fabric and and dye it in colors that work. 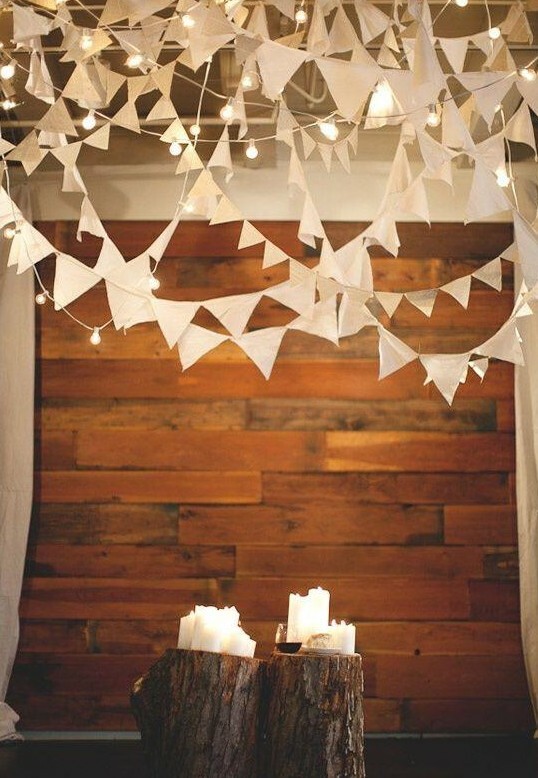 Alternatively, find plain sheets at thrift stores and cut them into strips to drape artfully over a simple wooden frame! 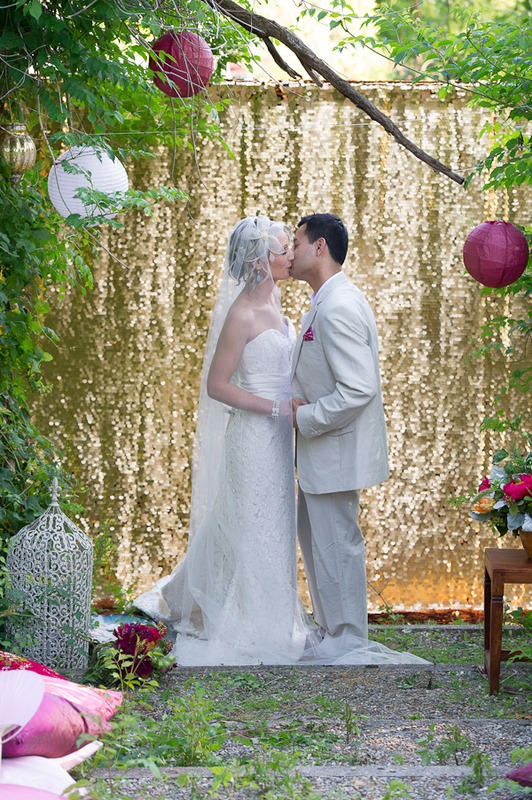 A sequin backdrop brings so much sparkle – literally! 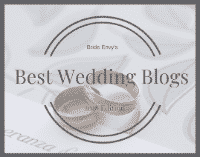 – to any style of wedding. Rustic? Yes. Gastby? Yes! In a fancy loft? For sure. On a farm? Definitely. 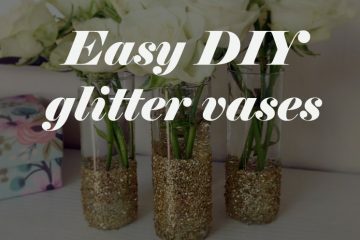 A sequin backdrop is easy to make with fabric, an inexpensive curtain rod or pvc pipe from a home goods store and a quick whip stitch! There are directions all over the internet for how to build a simple frame of branches. Once that’s done, drape it with soft, sheer fabric and add a bunch of flowers or greenery to one corner for a lovely accent. 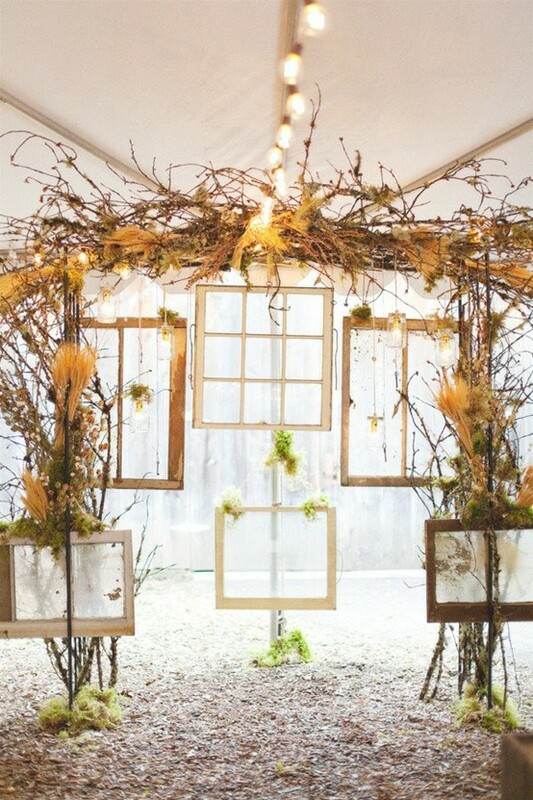 The same length of tulle can be used in the creation of a charming rustic backdrop if you’re getting married outdoors. 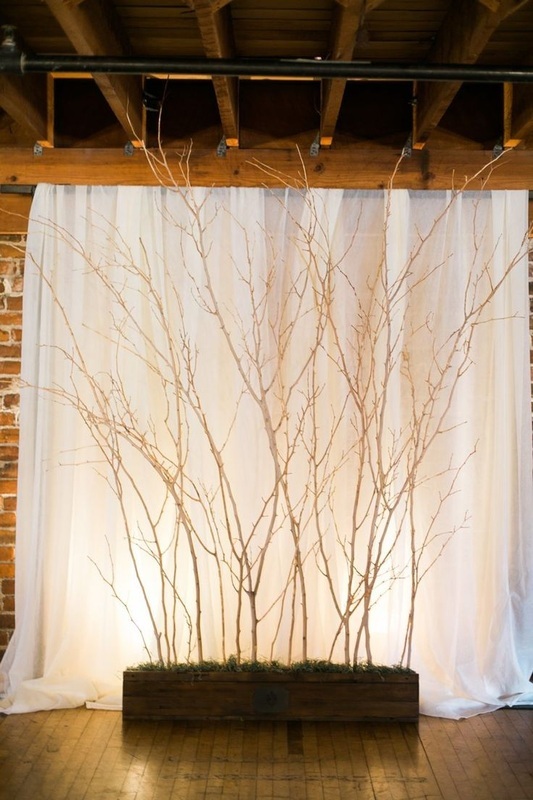 A bolt (or two, depending on the size of the tree) of soft fabric tossed over the branches creates an easy backdrop that’s equally easy to take down! 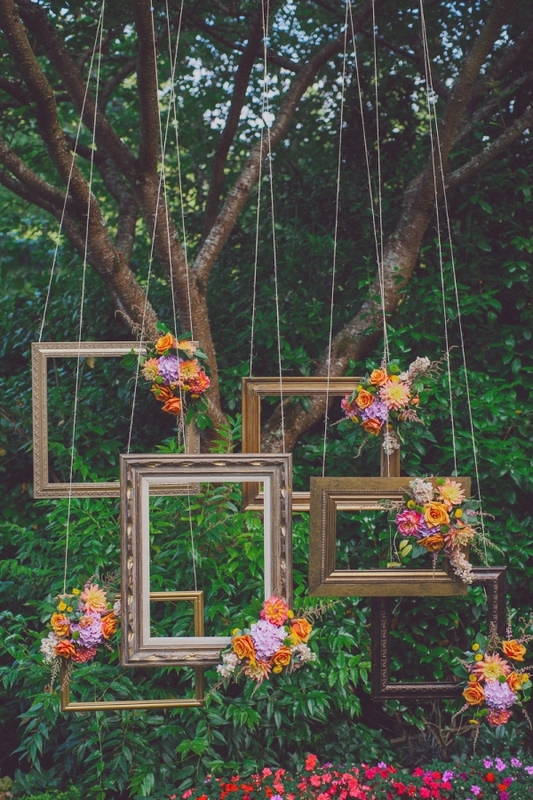 There are so many ideas for what can be strung to create an interesting and dramatic backdrop. Ropes in loose knots, feathers on glittery yarn, origami, pom poms, paper wheels, snowflakes, anything that represents the two of you makes for a perfect backdrop. This garland might take a little while to put together out of stems of greenery, but affixed to the wall in a beautiful spiral it makes a simple and graceful backdrop. 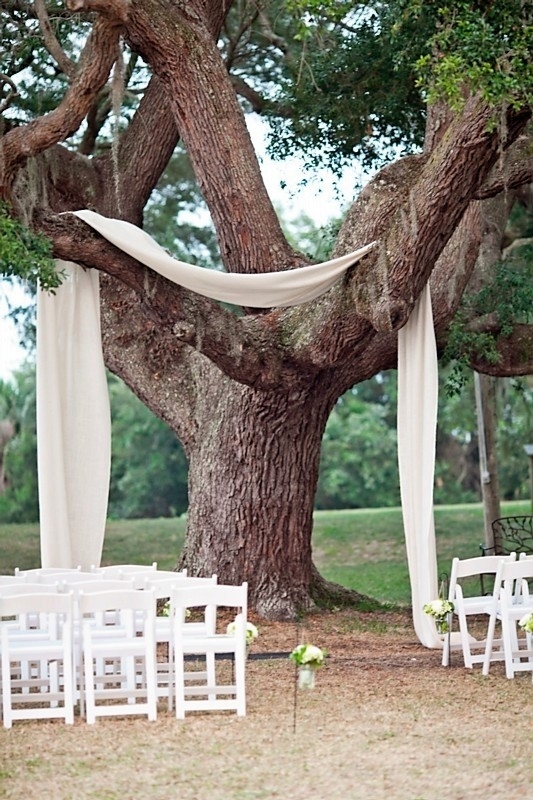 What a clever way to keep the focus on the ceremony in an outdoor location. Posts with curtains strung on clothesline can create a perfect backdrop – and unless i’m mistaken, those are very inexpensive curtains from Ikea. 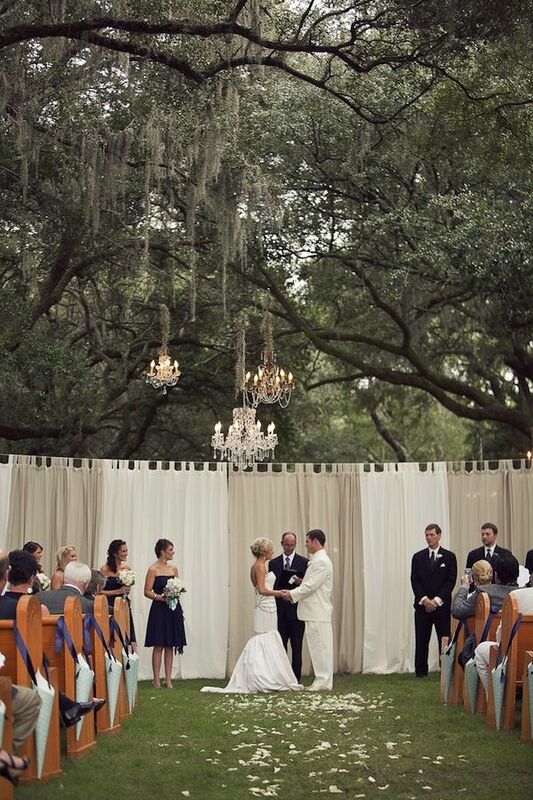 Even without the chandeliers, this is a beautiful way to frame a special moment. 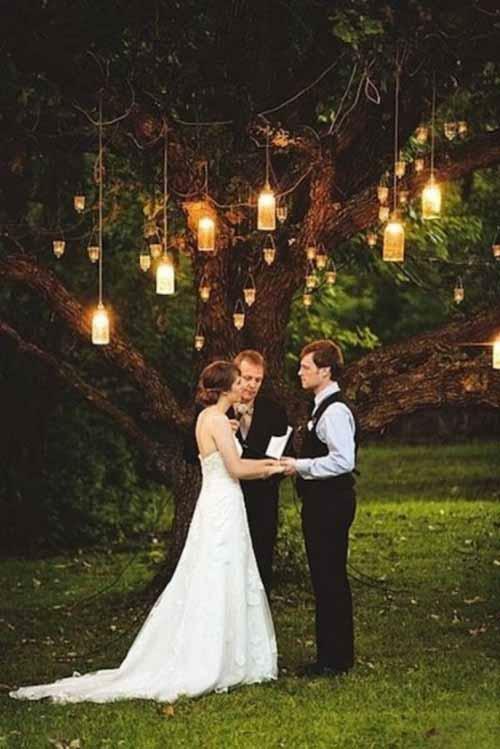 A charming setting for a sunset or early evening wedding ceremony is created with lanterns hung from trees. An easy way to replicate the look is by placing clear covers over industrial string lights and draping them through a stately tree. The smaller lights could be mimicked with these globe lights, or even some remote controlled lanterns! 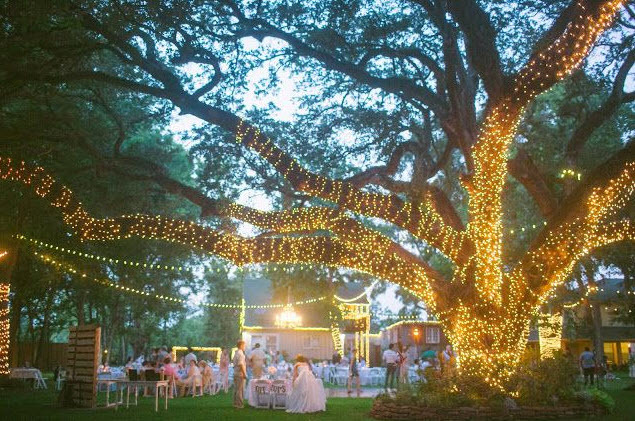 Another way to use a naturally stately tree as a gorgeous backdrop is to wrap the trunk and branches in small fairy lights. Regular christmas lights are inexpensive and effective, as are solar powered LED lights. 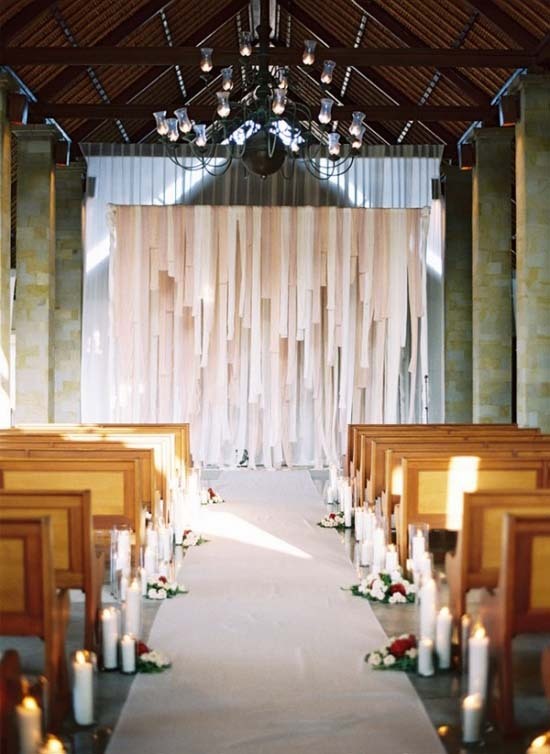 A pvc pipe spray painted silver works perfectly to support a curtain of fairy lights and small mirrors strung up to glitter and cast a fun effect on the ceremony. 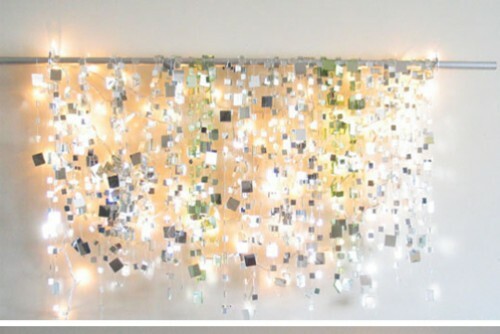 Bonus, it could be moved into the reception for a disco ball effect! 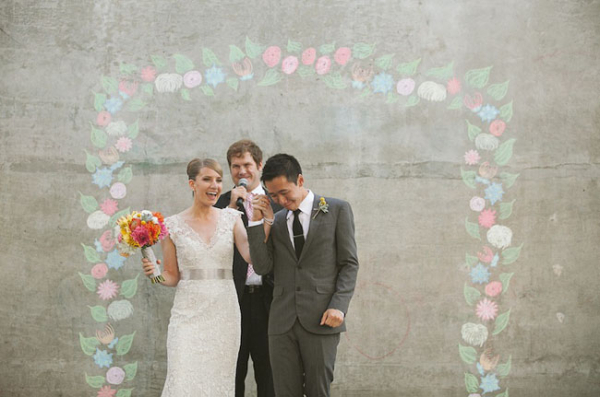 You’ll need more than just a couple of items from the craft store for this amazing backdrop! 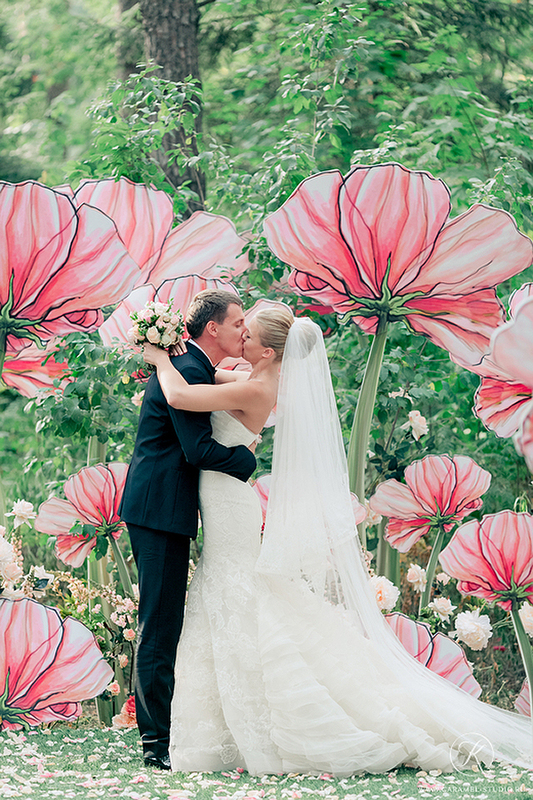 This is from an entire wedding that had professionally crafted stage-worthy pink poppies as a back drop mixed in with real flowers. We just loved how it looked! 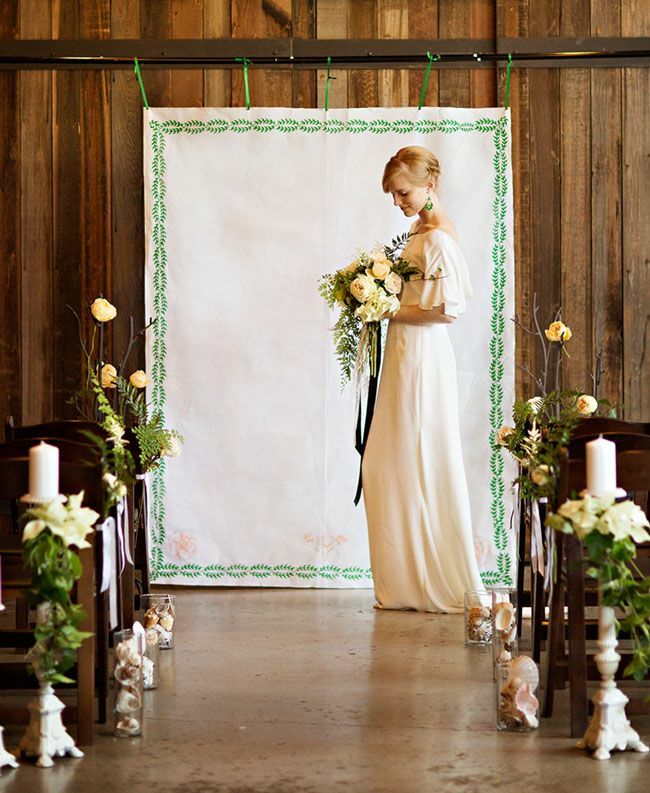 If you’re good with your hands, you can turn old pieces into a new-but-vintage piece that’s perfect for a rustic wedding backdrop! 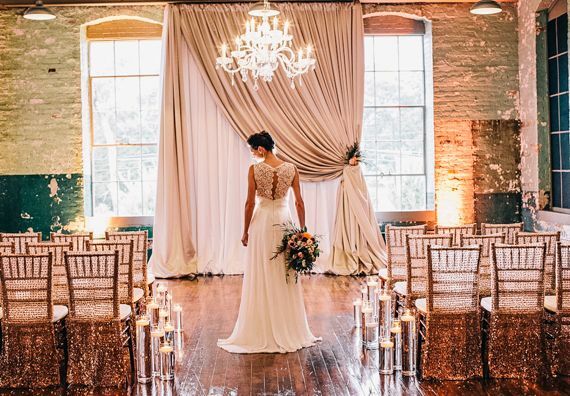 Three doors, two large window frames, a ladder and a chandelier create an absolutely delightful set up! 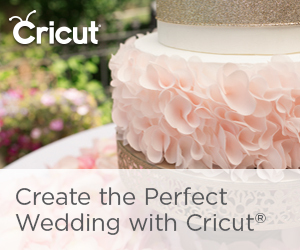 Get ready to get your scissors out! 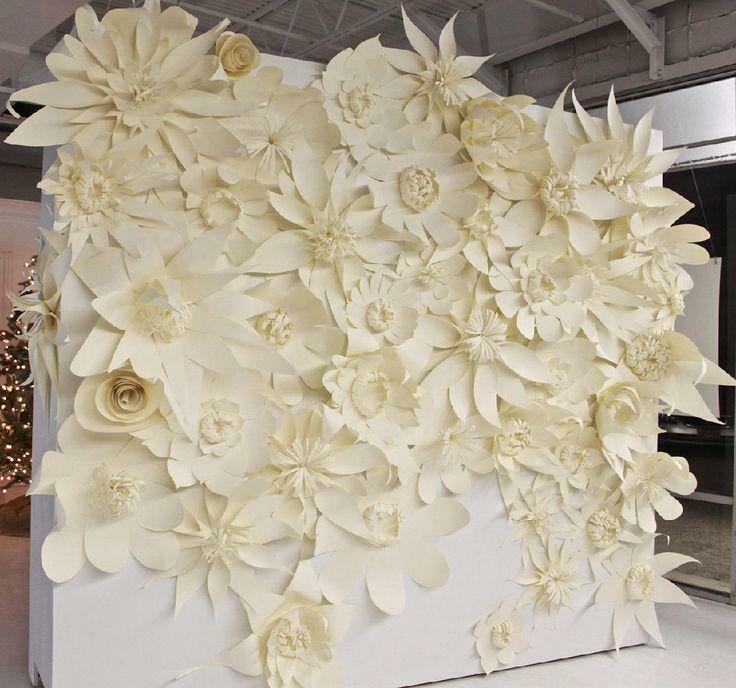 Papercraft at it’s finest created this beautiful wall of three dimensional paper flowers. 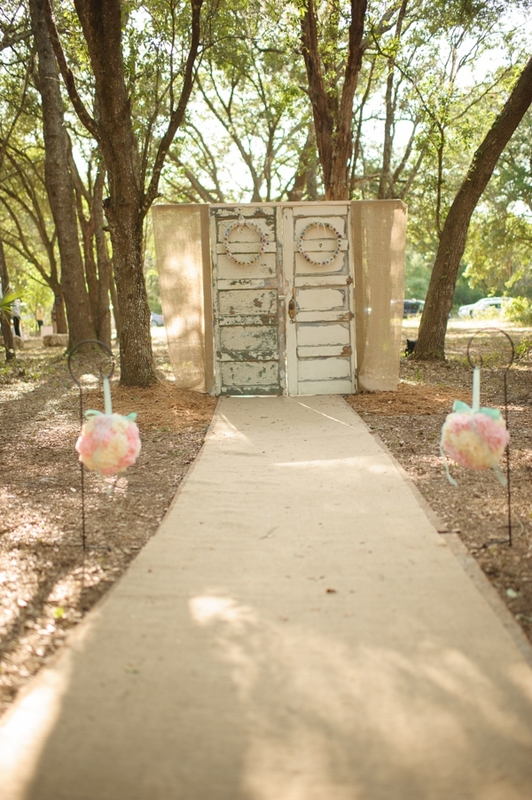 It’s a little crafty-and-vintage, a little Alice in Wonderland – and it’s one gorgeous ceremony backdrop idea. 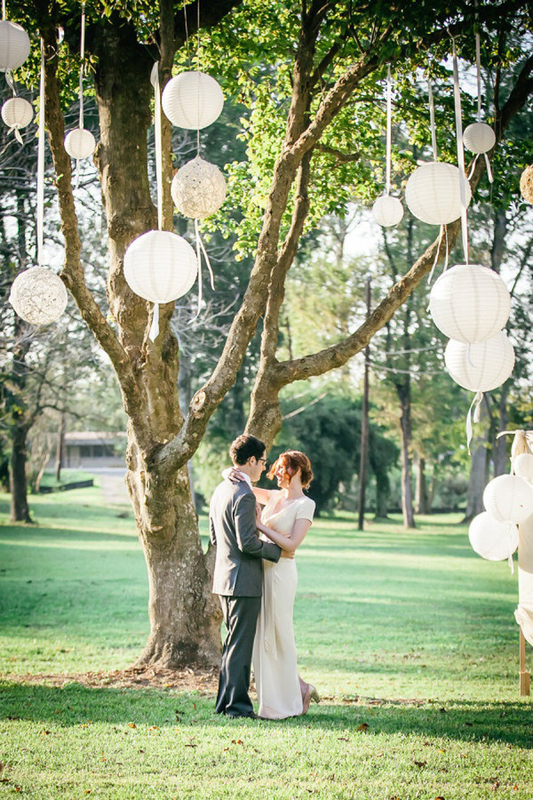 We’re totally in love with the yarn ball crafting, since we already featured them as a non-floral centerpiece, but mixed in with paper lanterns, they create a fascinating backdrop for a sweet wedding ceremony! Would you believe these are paper plates? We couldn’t either! But apparently that’s exactly what this ceremony backdrop is made from! Get a huge stack of them from Costco (the sturdy kind) and get started spray painting them. Punch holes in the middle and string them with knots in between each plate. 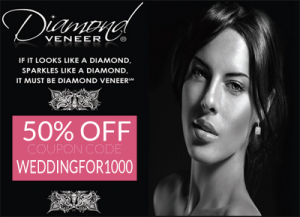 Amazing and super affordable! A double coat of chalkboard paint onto two sheets of plywood and you’ve got the basic background. Lightly go over it with the flat side of a chalk stick and wipe it away gently for the rustic look. 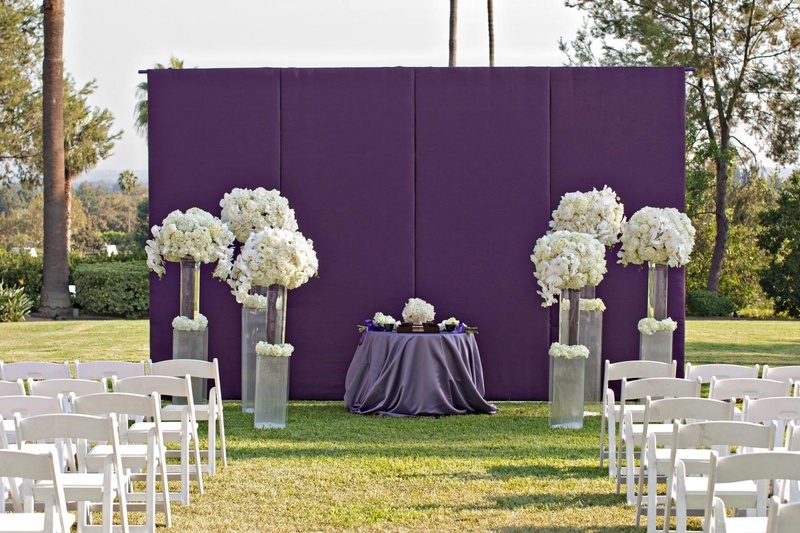 Then add your names and initials for a beautiful ceremony backdrop that can double as a photo booth background at the reception! What better picture than the two of you getting married, already framed. 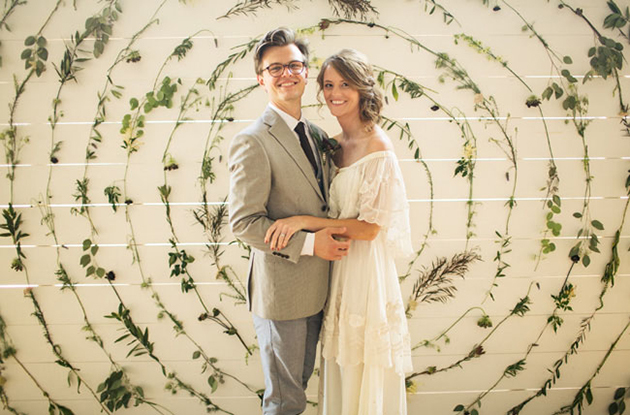 The image will stay perfectly preserved in everyone’s mind when you get married in front of a backdrop made from vintage frames attached to a metal arbor. 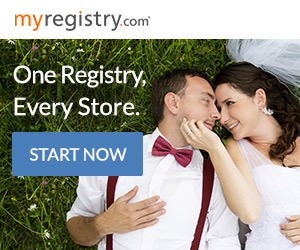 Why not use what is already available? 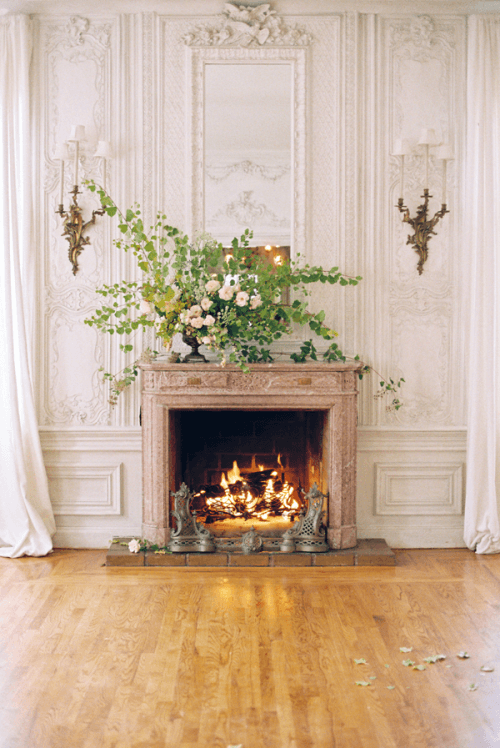 If you rent a historic home (which doesn’t cost as much as you might think, depending on where you’re looking), using the space as it already is and just adding a beautiful flower arrangement is perfect. 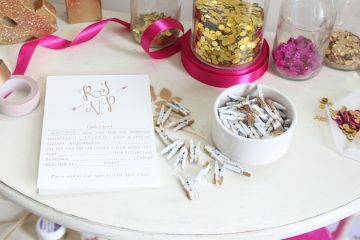 One giant sheet of paper + a stamp you like the shape of + ink in your wedding color + about an hour = amazing, simple backdrop that can be recycled. 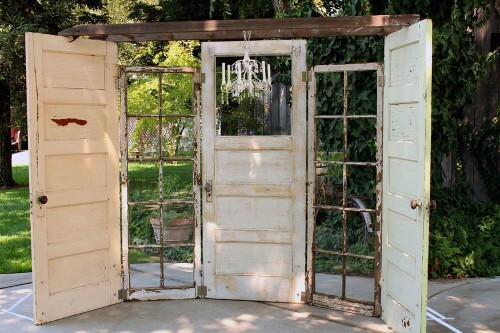 We’re huge fans of the vintage and recycled look around here, and these doors do just the trick to create a simple backdrop for your wedding ceremony. We couldn’t help ourselves – this is basically a combination of everything we’ve already swooned over. A vintage fireplace mantel, check. Beautiful, outdoor location, check. Simple but artful flower arrangements, check. How they got the fireplace mantel off the wall without breaking is still a mystery to us. 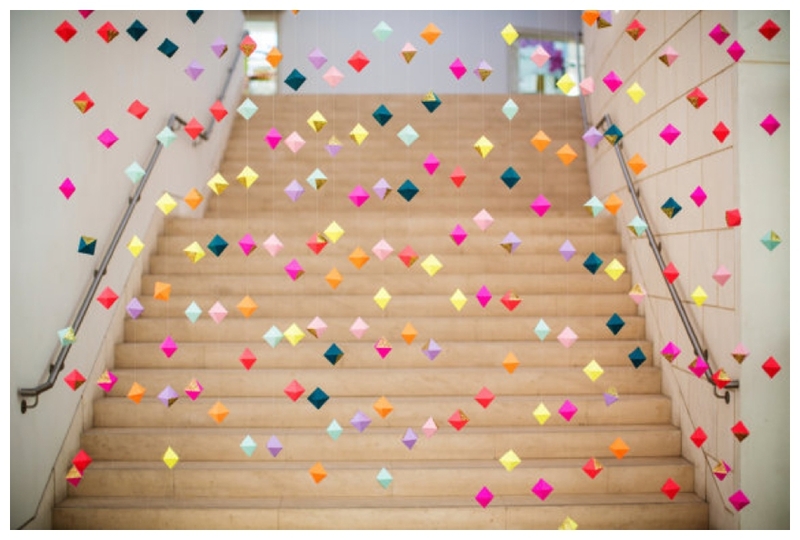 You can create the bunting yourself, string it up with funky lights and place in front of a funky wall. Exposed brick, rustic boards, a wall of wine bottles – you name it, it works. 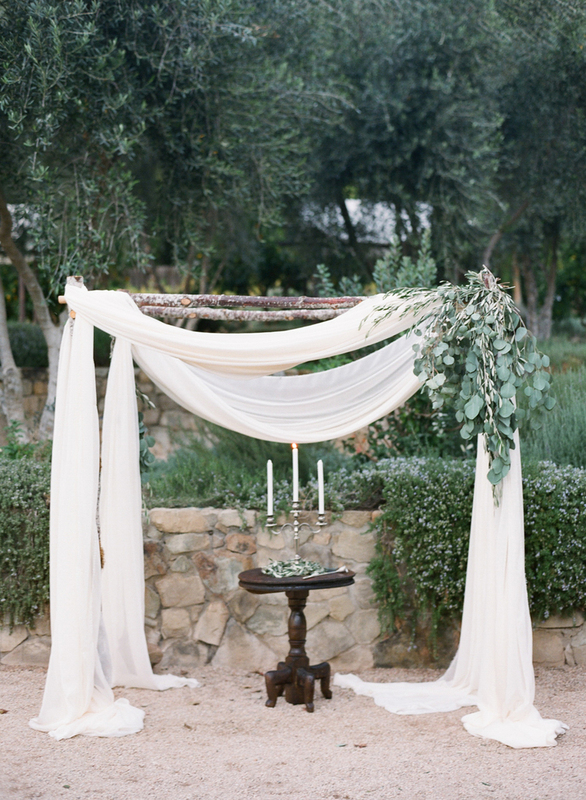 Lash together some bamboo poles for a quick and easy arch that you can then adorn with a simple length of sheer fabric. It can’t get much easier than that! 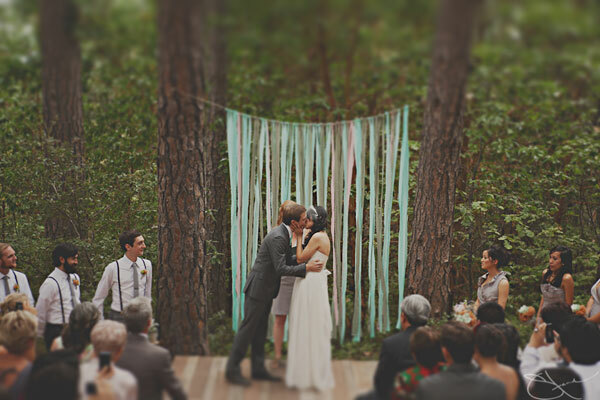 This gorgeous couple used nature as their backdrop and framed their ceremony with a wall of paper and fabric streamers strung between two trees. Absolutely beautiful. For a more elegant and less rustic framed backdrop, use deeply carved and rich-looking frames spray painted in deep metallics to create a display. 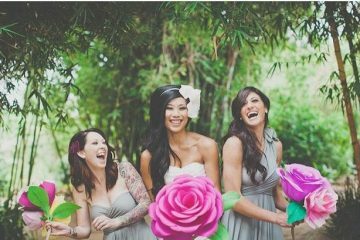 Adorn each with a small flower arrangement, corsage style. Keep an eye out around frame shops, since they’ve been known to toss old or slightly broken frames out to the dumpster. 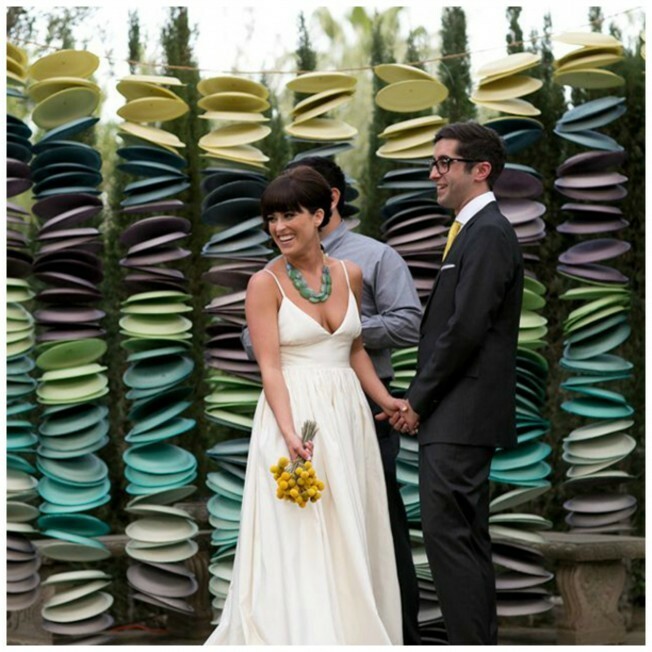 They might not look good on a wall anymore, but they’re perfect for a ceremony backdrop like this! 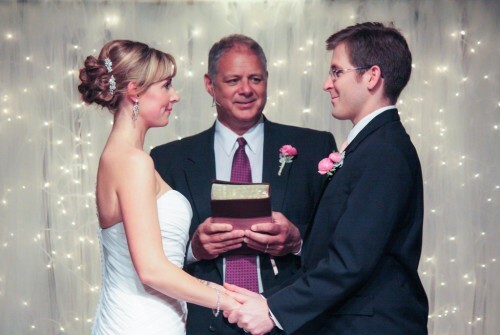 String lights hung from a tall frame and covered with layers of frothy tulle make for a romantic and beautiful backdrop, especially if the lighting in your ceremony is dim (or has to be low because otherwise it’s awful overhead lighting). Maybe they’re the first love note you ever wrote to each other. Maybe they’re the lyrics to your favorite song. Maybe they’re your wedding vows. 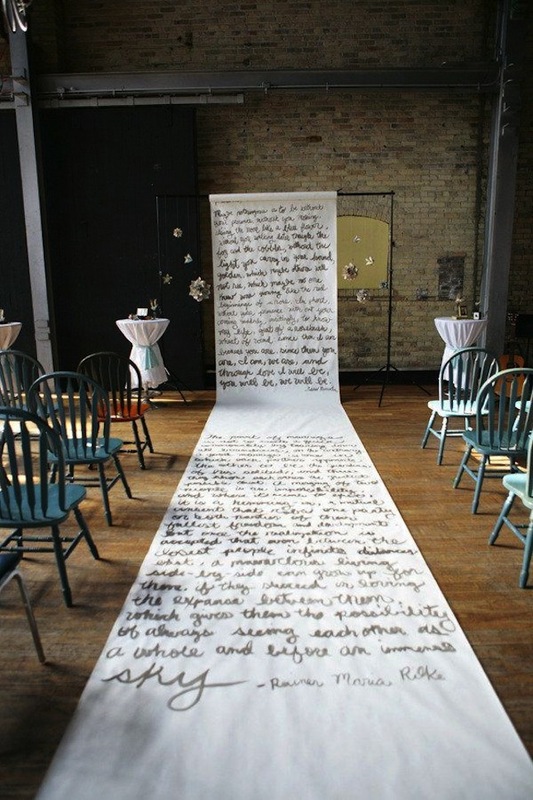 Either way, this long swath of four-foot wide butcher paper that combines aisle runner and ceremony backdrop is a clever way to save money, be crafty and say a message. That’s pretty sweet. 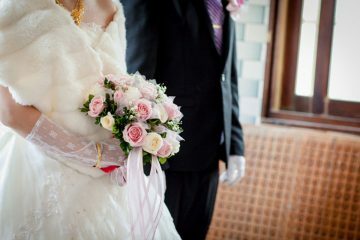 We love weddings, and we love finding ideas to help you plan your wedding on a budget. 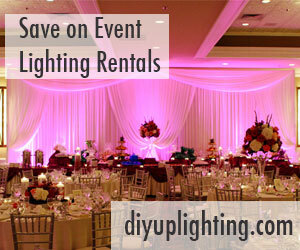 Don’t forget to check out our ideas for going wild with your wedding venue and planning a beach-style wedding. Be sure to sign up for our mailing list. 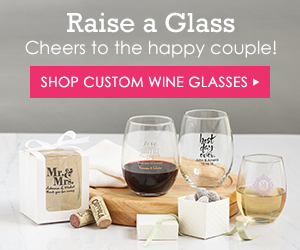 We only send out one or two a month, since we know you’re super busy!